This morning I was preparing my space before I started my blog writing for the day. I have 3 current blogs so I try to write at least one or two, sometimes three posts in a day. Anyhow, while I was getting ready I thought that I would share a part of what I do for my morning health routine and things I do throughout the entire day to remind myself to add in more of the things that add to my health regime in a positive way. In the picture above is my morning warm lemon water with honey which is in one of my favorite little glass pots from the thrift store. And behind it is a carafe of water I drink from when I need water . I like to drink it from this stainless steel wine glass (also a thrift store find) because it makes the act or art of drinking it almost sacred to me and is a great visual reminder when I walk by. I do think of any act that I do for the betterment of my health overall as sacred. My body is my temple and I am learning that the more sacred I make it, the more by body and soul both appreciates and receives it. called “How To 100x Your Productivity In A World Of Distraction” where he talks about our addiction to distraction. It seemed fitting for me today and I also was able to tie it into my thoughts around this blog post. Where do we get distracted around doing things for our health? Maybe we were going to go for a walk after dinner but we started checking Facebook and then it got too late. Or maybe, we had great intentions of making that new healthy recipe for dinner, but we got distracted with texting someone and ran out of time so we just threw something together healthy or not. So to bring this in for a landing the point I am trying to make with the water carafes, glasses, and teapot, is that it sets a definite intention for me. It reminds me to focus and to bring about, and to actually implement some healthy actions and to make them ‘sacred’. My sister told me a story once of where, at her work, when it’s lunch time, she puts on her desk a little teapot that signifies to her that it is indeed time to break for lunch and to en-JOY the time and to en-JOY her lunch break. The teapot is the sacred piece that sets the intention for her to focus on the moment. I have never forgotten her story and have implemented that philosophy in my own life. Maggie Holbik.com is a Board Certified Nutritionist and Certified Life Coach who loves focusing on and finding the beauty in each day and to bring more of that into her reality and she plugs along day by day and moment by moment. We live in a world where focus is even more important than your intelligence. Contact me for any reason. 🙂 I’d love to hear how you help yourself to focus on healthy additions to your day. Or perhaps you would like to be added to my inspirational newsletter that goes out on the 3rd of the month. Or you have questions about what supplements are good for what. Any question or comment is a good one in my books. 🙂 Feel free to shoot me a message and be sure to have an AMAZING day in the meantime! Yesterday I bought these organic grapes and by the looks of them, they need to be eaten soon. I love all the stages of ripeness to fruit, each one offering their different delights and benefits. What really made me smile about these grapes, is the shining one. I thought it was so awesome and a great example of something we can apply to our own unique selves. This grape was lit up by the sun and I am so in love with the sun lately. The more I connect with that thought, the more I know at a deep level, how healing the sun is for us and how it can infuse healing properties into plants! We too can be lit up and let our lights shine! We can too be our unique selves, in different stages of life and life’s challenges and glories. No matter where we are at it life, we have the opportunity to rise again and let our internal lights shine. Can you see how beautiful that shining grape is? That is you in all your glory, shining from within. How do we do this? We do it through self-acceptance, self-forgiveness, self-love, intention, and by believing that we are truly capable of letting that inner light out for the world to see. If you need to forgive yourself for something, do it! If you need to treat yourself more kind, do it! Do whatever you need to do to transition to this ‘lighter’ place. Today I encourage you to let the world see your light, even if it is one shining beam at a time until you can light up your entire being. 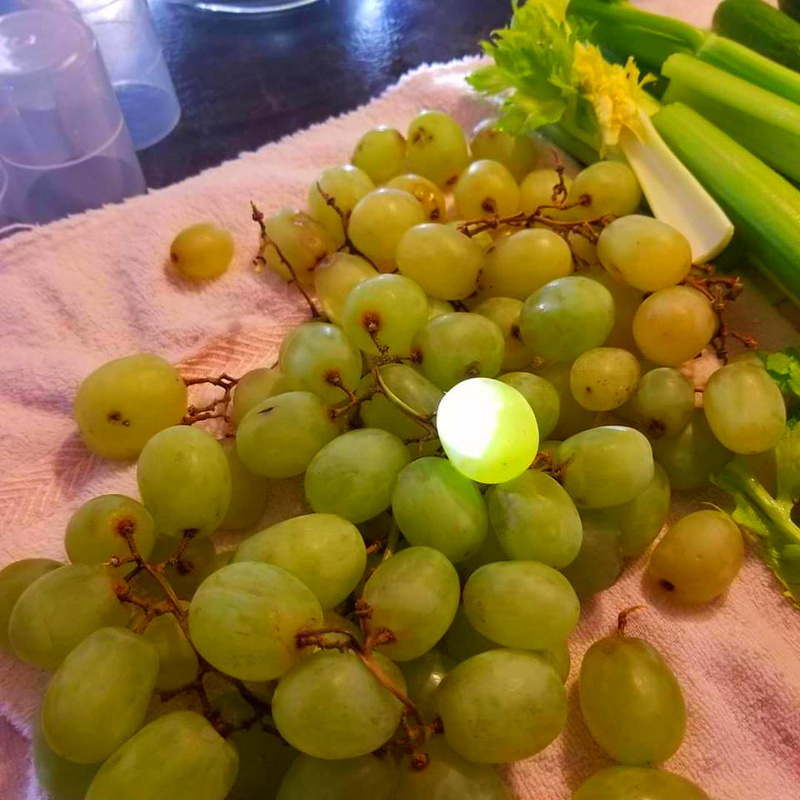 Keep the vision of this grape in your mind and know that by allowing your inner light to shine, you too can light up your soul and shine on, allowing the entire world to see your divine essence and beauty! Maggie Holbik.com is a Certified Life Coach and Board Certified Nutritionist who likes to let her light shine, but understands that true light can only come from the dark, so she believes all experiences offer the chance for inner growth and the opportunity to rise again in light and love. Compassion, Kindness and Forgiveness, are three Blessings we can offer ourselves and the world.